Are you craving pizza that’s super fast, cheesy and original? This one with steak and veggies is for folks who like their pie with everything on top. I like to use leftover steak, when I have it to make this an even easier pizza night. Dovetailing tip: Use the steak you had leftover from the Steak Diane, Meal 3. You may need to bake the pizza a few minutes longer to ensure the steak is warmed. Preheat oven to 450°. Season steak with salt and pepper. In a large skillet, heat oil over medium heat. Add steak; cook 5-6 minutes on each side or until a thermometer reads 145° for medium-rare doneness. Remove from pan. Meanwhile, place pizza crust on an ungreased baking sheet; spread with garlic-herb cheese. Top with spinach and onion. 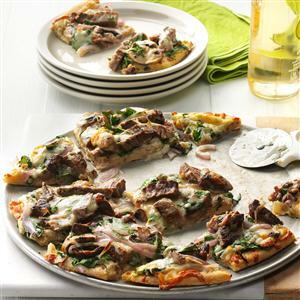 Cut steak into slices; arrange on pizza. Top with mushrooms and cheese. Bake 8-10 minutes or until cheese is melted. Cut into 12 pieces. Yield: 6 servings.